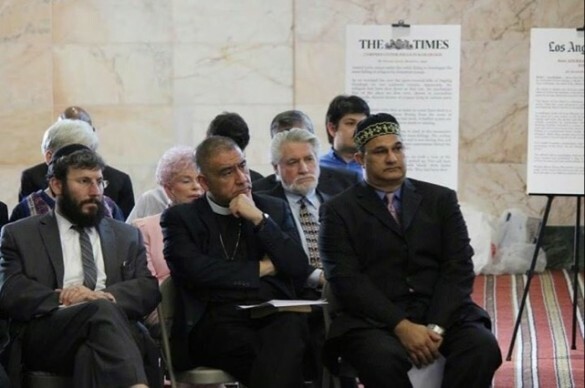 Seated left to right: Rabbi Yonah Bookstein, Bishop Juan Carlos Mendez of the Centro Cristiano Bet-El and Mahomed Khan. Standing in the mosque and reciting Tehillim, Psalms, I looked out at a large crowd assembled in the sanctuary. The diverse group included dignitaries from elected officials, Consul Generals, Honorary Consuls, FBI and LAPD representatives, as well as members of various ethnic communities. There were Jewish and Muslim children whose parents want them to see that they should not fear diversity, but respect other’s religions. The Jewish people are like the Mishkan. Each person has a unique purpose and all of our efforts are required to fulfill the spiritual mission of the Jewish people. Everyone is integral part. We can’t assign the work to only the righteous, the rich or the rabbis, because each one of us in endowed with special talents and an intrinsic value that others do not have.